Objective 1: Investigate the effects of different long-term (40 years) tillage practices on crop N capture. Expected outcome: Crops grown in the continuous no-till plots will have increased N uptake compared to crops in the conventional or reduced tillage plots. Objective 2: Determine how different long-term tillage practices affect N2O emissions. Expected outcome: No-till is expected to release similar N2O emissions as compared to chisel/disk and moldboard ploughing is expected to release the highest cumulative N2O emissions. Objective 3: Evaluate how the microbial communities associated with NA and N2O consumption change in relation to a) tillage practices, b) bulk soil versus rhizosphere soil, and c) rhizospheres of different crops. Expected outcome: a) Bacteria and archaea containing nosZI and nosZII genes will be lower in the no-till plots due to the higher bulk density, higher water filled pore space, and more anaerobic conditions anticipated in the no-till plots. b) Rhizosphere soils will have higher concentrations of C, leading to higher concentrations of genes responsible for carrying out N2O consumption and NA compared to the bulk soil samples. c) Rhizosphere soils of soybean will have higher concentrations of N, will lead to higher abundances of nosZ-carrying bacteria. Objective 4: Investigate the effects of tillage on NA and N2O consuming rhizosphere communities of different crops. 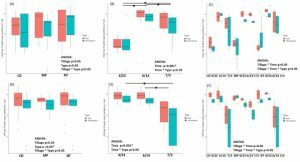 Expected outcome: Bacterial NA and N2O consuming rhizosphere communities will be most similar within tillage treatments and least similar across tillage treatments. Objective 5: Evaluate how the denitrification and N2O consumption potential of the soil communities from the long-term tillage experiment is affected by different a) tillage practices, b) bulk soil versus rhizosphere soil, and c) rhizospheres of different crops. Expected outcome: a) The denitrification potential is expected to be highest in the moldboard ploughed plots, where N2O emissions are also expected to be higher (see objective 1), while N2O consumption should be highest in the no-till soils. b) Rhizosphere soils will have higher denitrification and N2O consumption potential, due to the increased microbial biomass and increased availability of C expected. c) Rhizosphere soil from soybeans are expected to have the highest denitrification potential, while wheat is expected to have the highest N2O consumption potential. The overall objective of this project is to determine how long-term no till agriculture impacts microbial N dynamics of soils and ultimately crop N uptake in a corn-soybean-small grain rotation. In the northeast, dairies and smaller farms that produce a diverse range of crops dominate the region. Dairies are of particular importance because of the large amounts of manure that are produced from the cows. Most if not all of the manure will get applied to fields to grow crops and forage for their animals. To better conserve their soils and to increase soil health, farmers in the northeast are adopting no-till and cover cropping practices and there is a need to conserve N from manure and legume cover crops, rather than lose it to leaching, run-off or gaseous emissions. This proposal addresses the need to understand how no-till affects the activities and kinds of microorganisms that carry out soil N cycling processes. It has been hypothesized that over time (20+ years), the lower bulk density, water-holding capacity, and increased SOM expected for no-till soils (Linn and Doran, 1984; Guzha, 2004) will lead to lower soil redox values (Clay et al., 1990) and ultimately lower N2O emissions. Initially (during the first 10 years of no-till), N2O emissions are expected to be higher compared to plowed soils (Baggs et al., 2003; Singurindy et al., 2009; Regina and Alakukku, 2010; Mangalassery et al., 2014). Over the next ten years, emissions ae expected to become comparable (Grandy et al., 2006), and then lower than plowed soils after 20 years (Six et al., 2004). These projections are not supported by other studies such as the one by Oorts et al. (2007) showing that 30 years of no-till still showed higher N2O emissions. This is perhaps due to infrequent N2O sampling (Singurindy et al., 2009; Nugroho et al., 2015). Therefore, this project is designed to measure N2O with higher frequency, especially following field operations including cover crop termination, ploughing or chisel/disking, fertilization, and crop harvest, as well as after rainfall events. It is unclear how tillage will affect NA in these systems, as there are no published studies that have focused on this specifically. However, it has been hypothesized that systems that have higher moisture, higher SOM, and lower redox status may stimulate NA competition (Rütting et al., 2011). Therefore, it follows that no-till systems may provide conditions conducive to increasing NA activity (Bhowmik et al., 2017) and promoting the growth of bacteria known to carry out NA (Ceja-Navarro et al., 2010). Similarly, crop rhizospheres may provide excellent conditions for increased NA due to the increased C from root exudates, lower oxygen availability due to heterotrophic respiration, and abundance of microbes that can carry out NA like rhizobia (Rütting et al., 2011). With the rise of no-till and increased diversity of cropping systems, it is clear that research needs to be performed to identify the most sustainable agricultural practices. Promoting tighter plant-microbe N cycling through NA and N2O consumption is important for not only the environment but also for farmers, as increasing the efficiency of the soil N cycle will result in lower quantities of fertilization and increase the profitability of farming in the northeast. Paired bulk soil samples and rhizosphere samples were collected in the spring and summer of 2018 across all three tillage treatments. Samples were taken from volunteer wheat (4/23/2018), and corn at three different vegetative growth stages to include V3/4, V5/6, and V9/10 on 6/14/2018, 7/3/2018, and 7/13,2018, respectively. Soil samples were collected with a 19 mm diameter soil sampler at a depth of 0-15 cm at 12 locations across each plot. Similarly, 12 plants were dug up to collect root samples. Roots were shaken in the field to remove non-rhizosphere soil. Each set of 12 samples were homogenized and a portion of the samples were stored at -80C for molecular analysis, while the rest were stored at 4C. Soil moisture was assessed by drying wet soil and calculating the percent of water lost. Approximately 0.25 g of soil was used for DNA extractions with the Qiagen PowerSoil DNeasy Extraction kit. Following extraction, DNA yield and quality were assessed using a Thermo Scientific NanoDrop spectrophotometer. Quantitative PCR (qPCR) was used to quantify the concentration of N2O consumer and nitrate ammonifiers in each sample. For N2O consumers the marker gene nosZI was amplified using the nosZIF (WCSYTGTTCMTCGACAGCCAG) and nosZIR (ATGTCGATCARCTGWCRTTYTC) primers, while nrfA was amplified with the nrfAF2aw (CARTGYCAYGTBGARTA) and nrfAR1 (TWNGGCATRTGRCARTC) primer set. Amplication was performed on an Applied Biosystems ABI 7500 real-time thermo cycler using the following conditions: holding stage was set to 50C for 2 minutes and 95C for 10 minutes, for nrfA there were 40 cycles in the cycling stage and the first step was 95C for 15 s followed by 51C for 1 min, and 60C for 15 s, and a continuous melt curve that started at 95C for 15 s, 56C for 1 min, 95C for 30 s, and 60C for 15 s, while nrfA amplification was performed with 40 cycles at 95C for 30 s, 56C for 1 min, and 72C for 45 s, followed by a melt curve stage of 95C for 15 s, 56C for 1 min, and 95C for 30 s and 60C for 15 s. Values were corrected to reflect log 10 gene copy numbers per gram of dry soil for reporting and graphing. Statistical analyses on nosZI and nrfA gene copy numbers were analyzed in R using log 10 transformations of the gene copy numbers. To compare the abundances of either nosZI or nrfA across the tillage treatments (MP, CD, NT), crop rhizospheres (wheat, corn at V3/4, corn at 5/6), sample type (bulk or rhizosphere), and combinations of these variables, mixed modeling was performed with lmer (lme4 package; Bates et al 2015) to include block as a random variable, following by an ANOVA. If the ANOVA resulted in a significant result (p<0.05), then post-hoc pairwise comparisons were performed with lsmeans (Russell Lenth, 2016). To determine how the mean abundances of nosZI and nrfA change in relation to crop rhizospheres, and sample type, an ANOVA model was analyzed. Pairwise comparisons were performed following significant ANOVA results (p<0.05) using Tukey's honestly significantly different (TukeyHSD) tests with tukey p-value adjustments. Plots of log 10 gene copy numbers per gram of dry soil were created using ggplot2. Gaseous emissions of N2O were measured across the with a fourier-transform infrared spectrometer (FTIR) in the field. Measurements were continuously taken for approximately five minutes at each plot. To quantify the amount of nitrogen loss from these systems, N2O was converted to gN-N2O/ha/day by multiplying the slope (N2O measurements over the five-minute interval) by the time of measurments, to get ppm N2O, then multiplying ppm N2O by constants, 1.94 and 1459.87. Composite bulk soils samples (10/plot) were also collected at the time of N2O measurements. Again, a portion of the homogenized soil samples were stored at -80C for molecular analysis. Of the rest of the soil, half was air-dried and the other half was stored at 4C. Air-dried soil samples were ground to 2 mm and approximately 2.5 g of soil was used to measure labile carbon using the permanganate oxidizable carbon (POXC) fraction method. Inorganic nitrogen analysis to include measurement of NH4 and NO3 were performed following extraction with 2 M KCl. Soil temperature and soil moisture measurements were taken at a depth of 7.5 cm. Statistical analyses were performed in SAS 9.4 (SAS Institute Inc., Cary, NC, USA). Analyses included mixed modeling using proc mixed to account for repeated measures (longitudinal) and random effects (blocking). Post-hoc analyses were performed using lsmeans and tukey adjustments were made to p-values. Additional analyses to assess the correlation between gN-N2O/ha/day and POXC, NH4 and NO3, were also performed. To date, samples have been collected and data generated to partially answer objectives 2-4. For each of these objectives, as well as for objectives 1 and 5, samples will continue to be taken and data generated/analyzed into the winter of 2019. As such, results described here are preliminary and may change as more data is added to the analyses. For objective 2: Measurements of N2O loss were taken in the spring (before tillage) and continued into the fall to monitor N2O pre/post-harvest, results presented here include data collected through September 5th, 2018. Later dates were also monitored but data has yet to be analyzed. Nitrous oxide (N2O) emissions peaked across all three tillage treatments (CD, MP, NT) following sidedressing corn with UAN (Figure 1). Emission from NT was highest on June 4th, which was 1 day post-sidedress and 7 days post-planting/fertilizer application and was approximately 1535 gN-N2O/ha/day (n=4). On June 11th, the highest N2O emissions were measured from the CD treatment at 2178 gN-N2O/ha/day (averaged across the four blocks). While MP also peaked on June 11th, the emissions were significantly lower than CD at 211 gN-N2O/ha/day. Analyses indicate that N loss as N2O was significantly higher in the CD treatment compared to NT or MP on June 11th and was higher than N2O in CD treatments across the other sampling events (p<0.05). 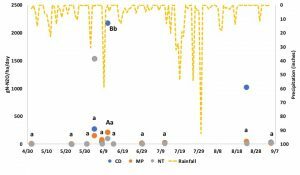 Rainfall amount seemed to also correspond to N2O peaks, as there were two large peaks in rainfall days before the peaks in N2O. Another peak of N2O emissions was also captured from the CD treatments on August 23rd, 2018 and was quantified as 1019 gN-N2O/ha/day. Peaks of N2O are generally observed between 1-2 weeks post-tillage (Figure 1). Since N2O emissions for the NT treatment peaked on June 3rd, before UAN was added as a sidedress, it is likely that N2O production was stimulated by either the small physical disturbance of planting or the addition of the synthetic fertilizer at the time of planting, or perhaps a combination of the two disturbances. In contrast, N2O from both CD and MP peaked nearly two-week post-tillage and eight days post-sidedress, so it is hypothesized that the N2O was most likely a result of sidedressing rather than tillage. Cumulative losses of N2O from May 2nd, 2018 through September 5th, 2018 across the three treatments were as follows: CD 14,307, MP 2,307, NT 6,870 gN-N2O/ha for the 11 days that N2O was monitored. Despite these differences in cumulative N2O losses, there was not a significant difference in N2O loss across treatments (CD vs MP vs NT), but there was a significant difference by date of sampling and a combination effect between date of sampling and treatment (p0.05) . This is not surprising, considering how variable the abundances of the genes were between sampling time points (different crop rhizospheres). There was a significant difference in the abundance of nrfA when comparing bulk and rhizosphere soils, as bulk soils had increased numbers of nrfA ( Figure 2; p<0.05). This was surprising because it was hypothesized that the increased amount of carbon in the rhizosphere due to root exudation would lead to increased gene copy numbers of both genes. When considering the types of crops and the vegetative growth stage of the crop, there were differences in abundances of both nosZI and nrfA (Figure 2; p<0.05). For nosZI, corn at vegetative growth stage of 3/4 had significantly higher amounts than corn at 5/6 and wheat (p<0.05). Corn at 5/6, while lower than at 3/4, still had higher gene copy numbers of nosZI compared to wheat (p<0.05). In contrast, nrfA was significantly lower than corn at 5/6 compared to both corn at 3/4 and wheat (p0.05). Indicating that the abundances of each of these genes is not related to these factors. Still, there seems to be a general trend of increased variation in gene copy number across the four blocks over time. Comparisons between nosZI and nrfA abundances across sampling dates did result in significant differences within each of the three tillage treatments (Figure 3; p<0.05). In all three tillage treatments, there were significant differences between the gene copy numbers in both the rhizosphere and bulk soil samples taken from corn at 3/4 (Figure 3; p<0.05). In MP, there were also differences observed between nosZI and nrfA abundances in samples taken from corn at 5/6 (Figure 3; p<0.05). Additional analyses were also performed to compare the abundances of nosZI or nrfA across sampling date and type (i.e. CD wheat rhizospheres compared to CD wheat bulk soils for nosZI). Results from this analysis indicated that in the MP treatment there are differences in the abundance of nosZI between rhizosphere and bulk soil samples at both corn growth stages (Figure 3; p<0.05), but no differences in the wheat samples. There were no differences in nrfA between rhizosphere or bulk soil samples (Figure 3; p<0.05).